I finally updated FlexSpaces (version 0.931) to not need a recompile for a server URL change with LiveCycle Content Sevices ES (changes to FlexSpacesConfig.xml and to server side services-config.xml still required). I tested with LiveCycle ContentSevices ES 8.2.1 and also with the LiveCycle ES2 M3 R3 beta. On ES2, I also tested with the Alfresco Calais Integration and it works fine via the FlexSpaces Calais UI (auto semantic tagging, tag suggestion, google map geo-tagging). Nice thing about the ES2 installer is it allows you to include custom AMP files. I used the turnkey install, selected the custom option when the Configuration Manager ran. I had the calaisIntegration.amp release 1.1 in c:\amps. When the config mgr is deploying content services, check the include custom amps checkbox, and browse to choose c:\amps. 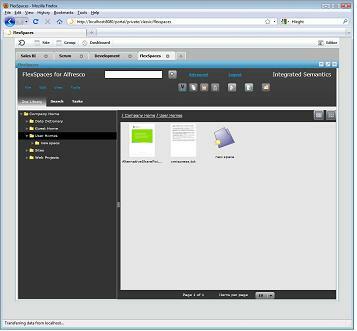 Still have two remaining problems with FlexSpaces on LC Content Services. Get an authentication prompt on upload that can cause the first upload not work on AIR/Windows (on Mac/AIR, Windows/Mac/browser get errors on upload). Alfresco has an alf_ticket URL arg that makes it easy to authenticate with. You can’t use this with LiveCycle ContentServices. You have to use authentication headers. Flex doesn’t let you use headers with FileReference.upload() or navigateToURL() (view a file given an Alfresco download URL). For navigateToURL, it works other than getting an authentication prompt the first time using file viewing.For uploading, I think by switching to upload to /remoting/lcfileupload instead directly to a webscript url will be the part of the solution. This will get files into the LiveCycle “Repository”. Just need to get files from there to the LiveCycle Content Services repository. Unlike this ADC article I don’t want to have to require the LC Process Mgt option. If anybody has some suggested APIs or sample code, let me know. Don’t think there is a work around for the navigateToURL issue. 1. Changed to new up a ChannelSet with channel URLs coming from the FlexSpaceConfig.xml Spring ActionScript file instead of compiling in a services-config.xml.2. See doc\livecycle\readmeLiveCycleContentServices.txt for FlexSpacesConfig.xml LC CS specific changes, and server side services-config.xml changes still required.3. Note FlexSpaces needs its FlexSpacesConfig.xml configured with a Calais key and a Google Map api key to get UI for the Calais Integration enabled (see doc\flexspacesAir\readmeFlexSpacesForAIR.txt)4. For instructions on adding an amp to an existing install (of 8.2.1, dir name, deploy areas different on ES2) see Dr Flex & Dr LiveCycle. (Haven’t tried the Calais Integration on LC CS 8.2.1. It should work since it works with Alfresco 2.1). 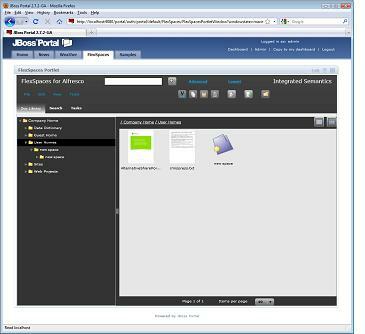 In addition to a Liferay portlet, I recently added a JBoss Portal portlet for FlexSpaces (Alfresco Forge, Google Code). See previous post about the Liferay portlet since some of the same things apply (setting up two app servers, pointers to SSO info, etc.). 10. in jboss portal switch to FlexSpaces tab, click on “Edit” on the flexspaces portlet and setup alfresco url if needed and other options and click update.